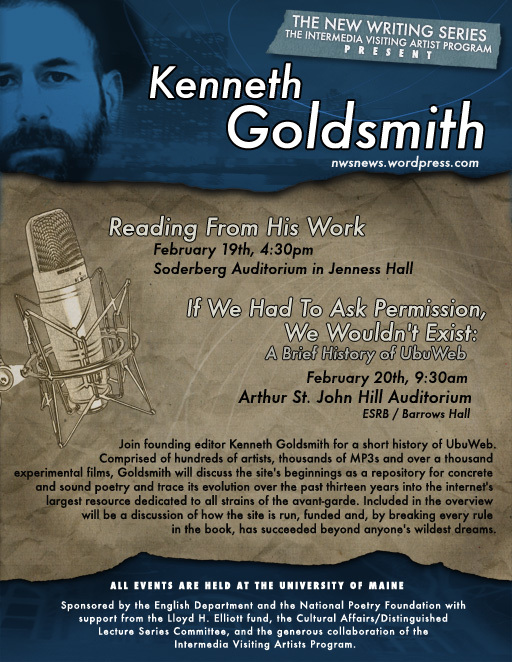 Kenneth Goldsmith read to an audience of 45 people in the UMaine New Writing Series on February 19, 2009. Goldsmith opened his set with an homage to Maine artist and poet Bern Porter before excerpting widely from his own works. A question and answer session with the audience followed. For more photographs, visit the NWS Flickr page here. An mp3 recording was made using an Audio-technical condenser Lo-Z AT835b microphone attached to a Marantz PMD660 Portable Solid State Recorder. The event was recorded on digital video tape by Carey Haskell. This event was co-sponsored by the UMaine Intermedia Visiting Artist Program, with generous support from the Lloyd H. Elliott Fund and the Distinguished Lecture/Cultural Affairs Committee. 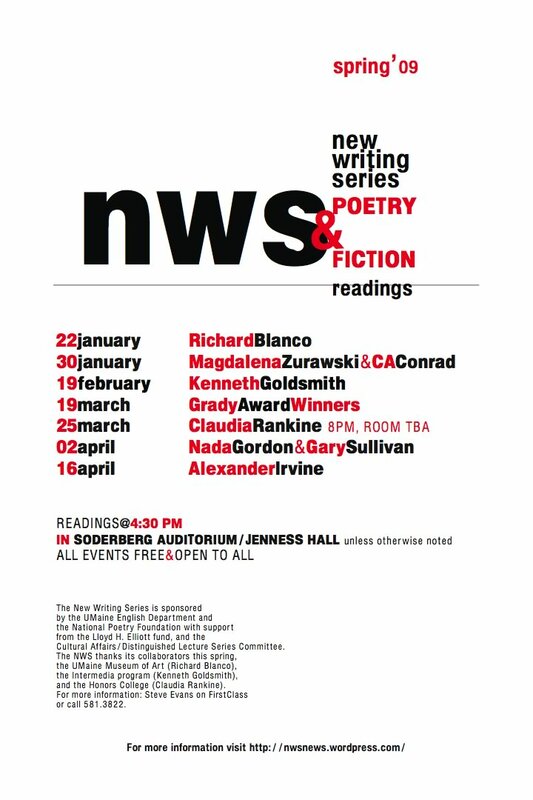 On January 30, 2009, fiction writer Magdalena Zurawski and poet CA Conrad read to an audience of about 35 people in Soderberg Auditorium for the second event of the Spring 2009 schedule. Steve Evans introduced the writers, who each read for about 25 minutes. Conrad read from The Book of Frank and Soma(tic) Midge. Zurawski read excerpts from her book The Bruise. Afterward, Zurawski and Conrad took questions from the audience. For more photographs, visit the NWS Flickr page here. An mp3 recording was made using an Audio-technical condenser Lo-Z AT835b microphone attached to a Marantz PMD660 Portable Solid State Recorder. The event was also recorded on digital video tape.